mugg magazine launches this evening in all its shiny new glory and we can’t wait to show it off! We’re wetting mugg‘s head tonight in Solas bar on Wexford Street and after a culmination of months of hard work and dedication we think we deserve a tipple (or ten) of celebration! If you fancy meeting the team, having a read of an intelligent new mag or even want to sate your penchant for sniffing the life out of new paper then you’re welcome to join us! Try and make it down and if you can’t we’ll keep you updated on how the event went…it’s sure to be a good ‘un. Check out a sneak peek of our nifty cover to whet your appetite! 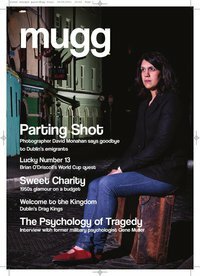 Here at Mugg we are putting the finishing touches to the magazine and excitement is building as we prepare to send it to the printers. The magazine is looking amazing so far thanks to our hardworking editor, contributors, section editors and our business, layout and editing teams. It’s been a long journey taking Mugg from a few brainstormed ideas to the quality magazine it has become and we can’t wait for you to enjoy the fruits of our labour.